This post is also available in Italian. Radio Italia is a national commercial radio station in Italy, playing some of the country’s most popular names in music. Over the last several years, the station has been placing a growing emphasis on digital media and promotion. Examples of this range from live-streaming broadcasts worldwide on their website and across apps like iRadioItalia and Android to expand their reach on social media. We connected with Arianna Chiapponi, the station’s Manager of the Press Office and Social Media, to learn more about their social media journey to becoming one of the most followed radio stations—both in Italy and worldwide. Social media allows the team to reach a larger audience. But for Radio Italia, having a strategic content plan plays an essential role in engaging the audience over shared interests. Over the past three years, Chiapponi and her team memebrs Francesco Gabrielli and Federica Di Giuseppe have built out the content strategy across many channels, with a focus on Facebook and Twitter specifically. Working with experts from Facebook, they began to analyze data through Facebook Insights reports to help understand what content made the biggest impact on their audience. They’ve discovered that music-related content—news, videos, new songs—that links back to their official website receives the most clicks. They use this content, coupled with straightforward language, to engage people in Italy and around the globe in conversations. When preparing for an event such as a popular concert or album release, Chiapponi and her team brainstorm the most creative and fun promotion strategy. Some of these creative initiatives include sharing snippets on Twitter of guest interviews and live-streaming videos on Facebook of the event. 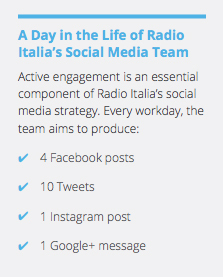 Hootsuite has been essential for keeping Radio Italia actively engaged online. From sharing “goodnight” sign-offs to their followers in the evening, to posting on weekends and throughout Italy’s summer holidays, Chiapponi and her team schedule messages and content in advance using Hootsuite scheduling. “Hootsuite makes our work much easier,” she says. They also use Hootsuite streams to help monitor conversations and growth across so many social channels. Customer feedback and inquiries no longer fall through the cracks thanks to the streams and tabs layout that keeps everything organized. Likewise, when promoting an event, Chiapponi can quickly add a stream to follow relevant keyword searches or event hashtags to engage the audience. 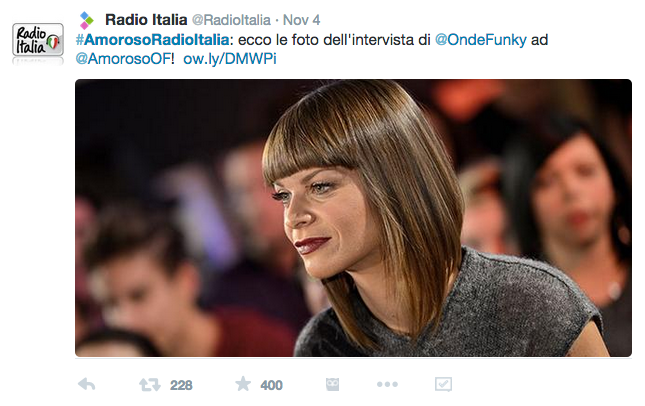 Radio Italia often live-tweets interviews with musicians. This post shares where fans can find images from an interview with musician Alessandra Amoroso. Radio Italia is the most “liked” radio station on Facebook in Italy—a success recognized by Facebook in a case study. In May 2014, the station had the goal of gaining 300,000 Facebook Page followers in two months. With the help of Facebook Insights and Hootsuite’s engagement and listening tools, they met their goal and became the first radio station ever to reach 2 million followers. As for Twitter, Radio Italia’s hashtags often trend nationally and have even gained an international presence online. While much of this attention can be attributed to showcasing globally recognized artists, such as Laura Pausini, Radio Italia’s online popularity can also be traced back to strategic planning. By creating and sharing engaging, audience-centric content with hashtags that drive traffic, the social media team was not only able to connect with listeners, but track and measure success. Developing a strong social media strategy and growing their following has paid off in more than just brand awareness. Since joining Hootsuite in 2012, they’ve seen a significant increase in radio station listeners and traffic to their website and web properties, such as their live streaming station. Use social media to grow your audience. Join Hootsuite Pro today.